Slack page for Curb magazine, produced each fall by students in the School of Journalism and Mass Communication at the University of Wisconsin-Madison. It was fine with me when I discovered my students were slacking last fall. In this case, slacking meant communicating with each other — and me — over the team messaging platform Slack. My students in a senior-level magazine capstone class were working together as a functioning newsroom with professional-level responsibilities to produce Curb magazine. They were collaborating to plan content, develop a cohesive design for print and online, assign photos and multimedia features, build a website, coordinate with the printer and raise more than $11,000 to get the magazine to print. "By choosing to organize themselves over Slack, it was a case of the classroom taking cues from the professional world." By choosing to organize themselves over Slack, it was a case of the classroom taking cues from the professional world — one of my students had read about its collaborative capabilities, and a couple had used Slack at internships and jobs in media organizations. My students chatted one-on-one with each other about assignments that needed to get done. They created channels for their different teams, which allowed them to make progress on their own group’s work. They shared files with each other in a way that made it easy to find what they were looking for weeks later. 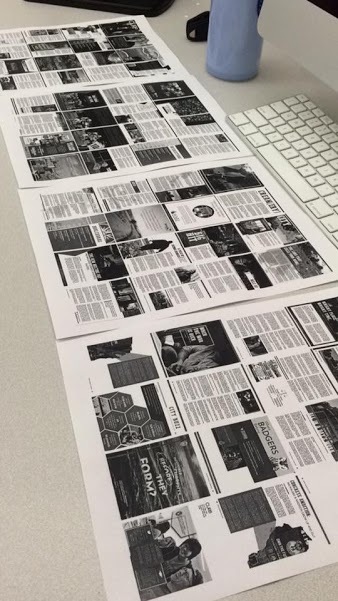 The layouts of Curb magazine sit ready for proofing by the student staff, which was organized last fall with the team messaging platform Slack. The students loved its immediacy and ease of use, and also that it gave them a place to chat quickly outside of a more personal social media platform like Facebook. And for me, it also meant that I didn’t have a bunch of student emails with time-sensitive questions buried in my inbox. Instead, I got push notices with the messages they sent me through Slack, and I could respond quickly and easily through the Slack app on my phone. I was able to answer their questions efficiently, and it helped keep up my end of getting the magazine to the printer on time. Slack says it doesn’t track how educators are using the application although it knows it’s being used at such institutions as Harvard, MIT, Dartmouth and UCLA. But out of its 3 million daily active users, there are many other instructors like me who are using it to organize and share information with students — and give them a platform for sharing with each other. A group of educators I queried on Facebook not only manage large-scale projects over Slack, but also use it to coordinate student media organizations, teach large journalism classes and manage teaching assistants, bring together students for collaboration across classes and create discussion boards on topics from class. Cindy Royal, professor at Texas State University and director of its new Media Innovation Lab, used it in a similar way as my magazine students — for managing a small group of students covering South By Southwest, a film, music and media festival held each year in Austin. One of the project’s goals is “whatever they’re talking about at South By Southwest, you want to be using,” Royal says. 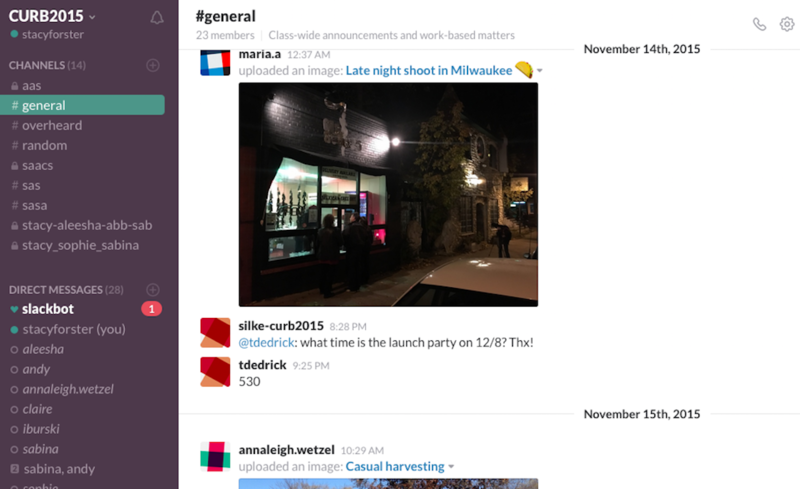 This year, that meant Slack, which replaced a Facebook group that had been used in years past. 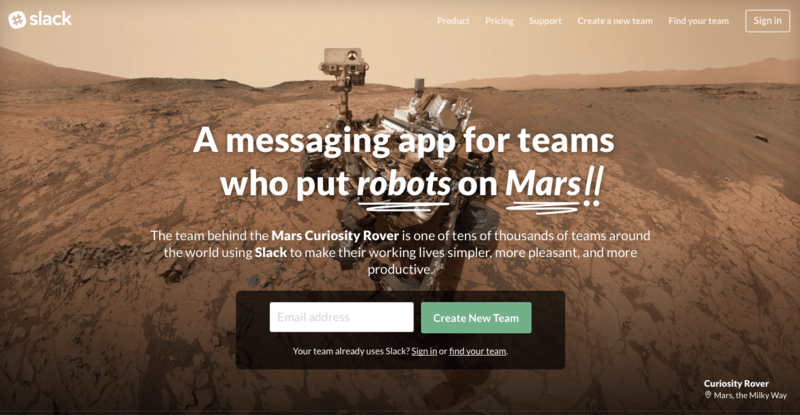 The website for the team messaging platform Slack. Slack is a huge improvement over the often-clunky learning management services that most universities provide to instructors, and some educators are using it for fostering discussion and sharing information with students. Royal taught a coding class this summer and used Slack channels as a message board, asking students to read a prompt and respond — something she might have otherwise done in a blog post. Slack was useful for bringing 50 students across two classes — TV news producing and a capstone journalism class — together to produce a newscast at Loyola University New Orleans. Visiting professor Lisa Collins says the students had a Slack channel for each newscast and uploaded scripts, video packages, photos and other elements. Not only could it be pulled from Slack for the newscast, she says, but web and social media producers went to the same spot to grab content for posting. Not only did it improve the process for students, Collins says, but it was a key instructional tool for her as well, allowing her to see when students weren’t pulling their weight. Paul Bush, associate professor of journalism at Franklin Pierce University, uses the messaging platform as a tool for curating stories for the students in his classes on social media and convergence journalism. He also finds it’s given him a way of dealing with a recent problem — students not reliably reading their email. It works because it’s easy to use, Bush says. He views it as a central repository for stories or websites that he finds and wants to share with students, and they can respond and discuss them with each other. How are you using Slack in the classroom? Share your thoughts and ideas on Twitter using the #EdShift hashtag. Stacy Forster teaches journalism and strategic communication in the School of Journalism and Mass Communication at the University of Wisconsin-Madison. She also serves as moderator for the #EdShift Twitter chats.